The Ahmed Kathrada Foundation condemns the theft of a statue of passive resister and child martyr,Valliamma Mudliar . Situated at Lenasia’s Rose Park, the site where the bust is located has been vandalised for a third time since its installation by the Tamil Federation of Gauteng in 2014. While the bust was previously partially damaged, and had paint thrown on it, this time, the entire sculpture was removed. 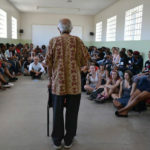 The Foundation’s Executive Director, Neeshan Balton, said that it is concerning that a site commemorating the life of a young anti-colonial activist could be vandalised for the third time. Balton explained that these passive resisters would lay the basis for similar, intensified campaigns in the 1940s, and later, non-racial struggle against apartheid laws. “Valliamma fell seriously ill after she was arrested and jailed in Pietermaritzburg for her actions. She died a few days after her release. She was just 16-years-old at the time,” he said. Nad Pillay, who was head of the TFG when the statue was installed, said that the bust was made of plaster of Paris, making it valueless if it was indeed stolen for the purpose of reselling. He added that there was clearly a “lack of understanding” about what the child martyr had stood for. Pillay urged anyone with any possible leads about the vandalism to contact him on 082 659 2446.